I have a few important updates to share about ScienceOnline Oceans! For those of you who haven’t yet heard, ScienceOnline Oceans is a conference (affiliated with the NC-based ScienceOnline) that will explore how marine scientists and conservationists can use the internet for collaboration, education and outreach. The meeting will take place October 11-13th at the University of Miami (Miami, FL), and will include an expert panel discussion on current ocean conservation issues, a day of conference-style programming, and a day of field trips allowing attendees to explore south Florida’s marine environment. Scientists who want to learn more about collaboration and outreach applications of the internet are welcome, as are science communicators who want to learn more about ocean issues. 1) The Planning Wiki is now online, and will be until April 1st! If you have an idea for a session, now is the time to submit it! For those of you new to the ScienceOnline community, theplanning wiki can be thought of as similar to a traditional conference submission page, but there are three important differences:1) everyone can see what everyone else has submitted, 2) anyone can add to what anyone else has written (including questions, suggestions, etc. ), and 3) the person who proposes a session can, but does not have to, actually run that session- you can simply suggest a topic that you’d like to see discussed and ask people to volunteer to run it (and you can also volunteer to help run sessions that others have suggested). We are offering four kinds of sessions at ScienceOnline Oceans. Skills workshops (taught by a hands-on leader to help people learn a skill), panel discussions (3-4 experts on a topic sharing their expertise, possibly including time for audience questions at the end), directed discussions (led by 1 or 2 discussions leaders, primarily consisting of the audience asking questions of the discussion leaders), and facilitated conversations (unconference-style discussions, essentially discussions between audience members facilitated by 1 or 2 moderators, which can be a follow-up to a panel discussion or directed discussion). Here is the link to the planning wiki. 2) To get more frequent updates, like us on Facebook and follow us on twitter! Like the ScienceOnline Oceans Facebook fan page here, and follow the ScienceOnline Oceans twitter account. You can also RSVP to the Facebook event, but this is not the same as actually registering for the event- it’s another way to stay informed, as well as to give us an early estimate of who plans on coming. 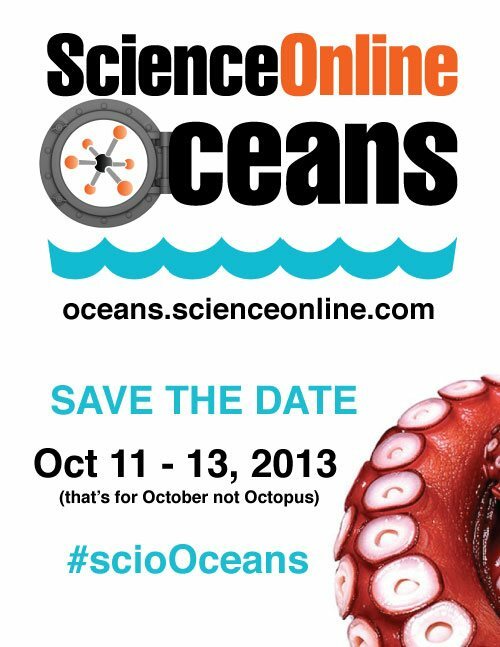 3) We’ve been able to increase the number of participants who can attend ScienceOnline Oceans! We had previously reported a maximum size of 150 participants, but the updated number is 200 participants! 4) We’re pleased to announce our Board of Advisers! The team includes some of the biggest stars in marine science, conservation, and outreach! 5) Registration for ScienceOnline Oceans will open approximately the 1st week of May. Stay tuned for more details!